This is a 10cm handcrafted statue of Odin made from ceramics (clay). It can be ordered by itself, with a sun post, or with a stone post. In Germanic mythology, Odin (from Old NorseÓðinn) is a widely revered god. 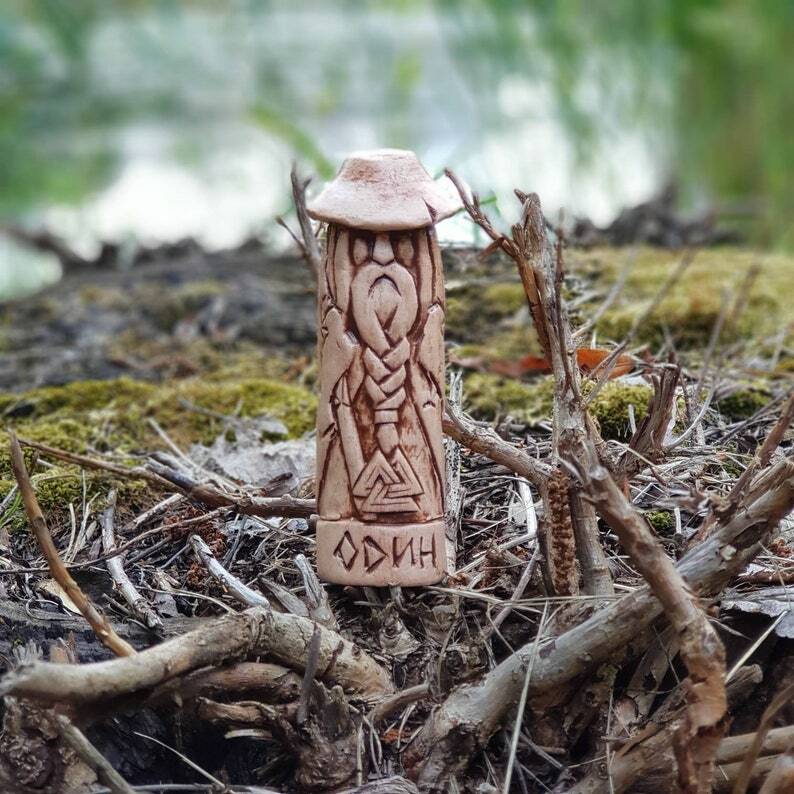 In Norse mythology, from which stems most of our information about the god, Odin is associated with healing, death, royalty, the gallows, knowledge, battle, sorcery, poetry, frenzy, and the runic alphabet, and is the husband of the goddess Frigg. In wider Germanic mythology and paganism, Odin was known in Old Englishas Wōden, in Old Saxon as Wōdan, and in Old High German as Wuotan or Wōtan, all stemming from the reconstructed Proto-Germanic theonym *wōđanaz. Odin is a prominently mentioned god throughout the recorded history of theGermanic peoples, from the Roman occupation of regions of Germania through the tribal expansions of the Migration Period and the Viking Age. In the modern period, Odin continued to be acknowledged in the rural folklore of Germanic Europe. References to Odin appear in place names throughout regions historically inhabited by the ancient Germanic peoples, and the day of the week Wednesday bears his name in many Germanic languages, including English. In Anglo-Saxon England, Odin held a particular place as a euhemerized ancestral figure among royalty, and he is frequently referred to as a founding figure among various other Germanic peoples, including the Langobardsand in most of Scandinavia. Forms of his name appear frequently throughout the Germanic record, though narratives regarding Odin are primarily found in Old Norse works recorded in Iceland, primarily around the 13th century, texts which make up the bulk of modern understanding of Norse mythology. In Old Norse texts, Odin is depicted as one-eyed and long-bearded, frequently wielding a spear named Gungnir, and wearing a cloak and a broad hat. He is often accompanied by his animal companions—the wolves Geri and Freki and the ravens Huginn and Muninn, who bring him information from all over Midgard—and Odin rides the flying, eight-legged steedSleipnir across the sky and into the underworld. Odin is attested as having many sons, most famously the god Baldr with Frigg, and is known by hundreds of names. In these texts, Odin frequently seeks knowledge in some manner and in disguise (most famously by obtaining the Mead of Poetry), at times makes wagers with his wife Frigg over the outcome of exploits, and takes part in both the creation of the world by way of slaying the primordial being Ymir and the gift of life to the first two humans Ask and Embla. Odin has a particular association with Yule, and mankind's knowledge of both the runes andpoetry is also attributed to Odin. In Old Norse texts, Odin is given primacy over female beings associated with the battlefield—the valkyries—and he himself oversees the afterlife location Valhalla, where he receives half of those who die in battle, the einherjar. The other half are chosen by goddess Freyjafor her afterlife location, Fólkvangr. Odin consults the disembodied, herb-embalmed head of the wise being Mímir for advice, and during the foretold events of Ragnarök, Odin is told to lead the einherjar into battle before being consumed by the monstrous wolfFenrir. In later folklore, Odin appears as a leader of the Wild Hunt, a ghostly procession of the dead through the winter sky. Odin is also particularly associated with charms and other forms of magic, such as in Old English and Old Norse texts. Odin has been a frequent subject of study inGermanic studies and numerous theories surround the god. 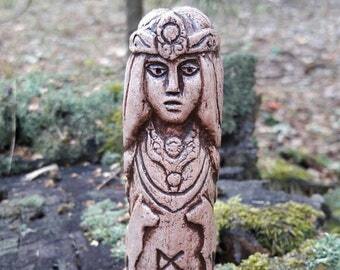 Some of these focus on Odin's particular relation to other figures, such as that Freyja's husband Óðr appears to be something of an etymological doublet of the god, whereas Odin's wife Frigg is in many ways similar to Freyja, and that Odin has a particular relation to the figure of Loki. Other approaches focus on Odin's place in the historical record, a frequent question being whether Odin is derived from Proto-Indo-European religion, or whether he developed later in Germanic society. In the modern period, Odin has inspired numerous works of poetry, music, and other forms of media. He is venerated in most forms of the new religious movement Heathenry, together with other gods venerated by the ancient Germanic peoples; some focus particularly on him. This was exactly what I was looking for. Great quality. Absolutely perfect, no imperfections , solid,exactly what I expected and paid for ! !